WOW!….. The month of April moved along very quickly. Where did it go? We are now ready to rush into May. The past two weeks have been extremely busy doing projects not directly related to the Learning Center. Well, now things are beginning to return to normal and I can get refocused on the Learning Center. Previously, I requested the teacher “friends” to send me a note so I could know who “all” the teachers are following this Blog. Several teachers have done this and thanks. Maybe some of you have not responded. I hope you will still take a couple seconds and send me a note if you represent the education community. I am very appreciative of the teachers on board specifically because the Learning Center project relates to education. At some point in the near future, I want to point out to the Learning Center’s Board that this project is strongly supported by American educators both past and present representing a wide range of educational areas. I also want to extend a very special invitation to all educators to provide feedback on what we are doing. In my last Post, I introduced the volunteer “stars” teaching at the Learning Center, Anna and John. I have been informed this is John’s last week at the Learning Center. He has now completed his tour of duty. John’s replacement Corinne is scheduled to arrive in mid-May and we will get her introduced to the “friends” as soon as she arrives. John, all the “Friends of Copey” extend our sincere thanks and appreciation to you. We wish you the best on your next adventure and invite you to continue your connection with the Learning Center as a follower of this Blog and dedicated “Friend of Copey”. I have been alerting everyone about some really good news coming soon and I can assure you it is still on the way. I can hardly keep from sharing it now but I have learned things can change quickly and not work out. So it is wise for me to be patient. But this news is getting closer and I want you to keep watching for it. Finally, I want to welcome about a dozen new followers who appeared to have joined the “Friends of Copey” over the past few weeks. I appreciate everyone who takes a couple minutes each week to see what is being posted and to get the latest news on the Learning Center. Certainly, followers come and go so those who stay connected are very truly appreciated. Holy Week or Semana Santa is being celebrated in Costa Rica this week. This is the week preceding Easter Sunday and is the time for the Learning Center to take a break. The background on Semana Santa is extensive and if you need or want to know more than this, you can Google Semana Santa. For us, it is a great time to catch up on what is going on at the Learning Center since it has been a couple of months since school started. Eve, the Learning Center’s leader, reports there has been a significant increase in enrollment this year compared to last year. In fact, there is a 68% increase, consisting of 36 elementary students, 22 high school students, and 5 adult students for a total of 63 students compared to 38 students last year. One of the “stars” helping make the Learning Center’s school year a success is Anna Hartley (pictured above). She is a Blue Grass music performer from Arkansas with her degree in Middle School Education. 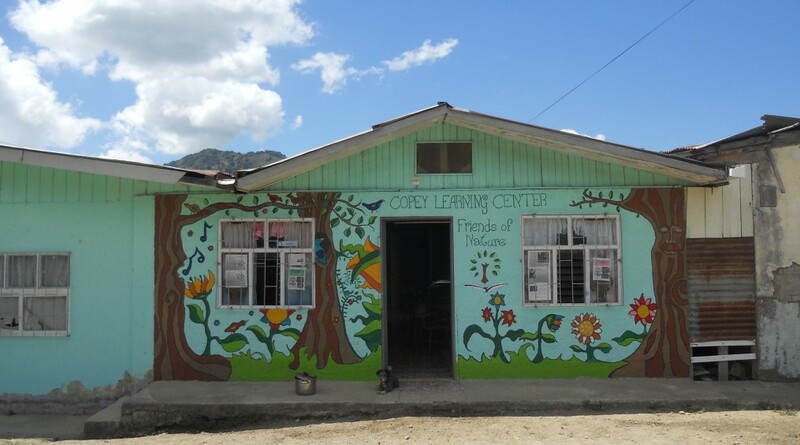 She spent time in the Honduras working as a volunteer at an orphanage and teaching English at a business and leadership school for young women before coming to the Learning Center in Copey. The other star teacher is John Fridrich who hails from Colorado. Similar to Anna, John is a colorful teacher with a background in writing for newspapers and teaching journalism. John played football at the University of Oregon, US Navy veteran, and a classroom teacher. He has traveled extensively having lived in Alaska, and traveled in both Central and South America. The students at the Learning Center are very fortunate to have both of these stars helping them expand their educational horizons and learn English from some real experts. With a new curriculum in place this year, early results indicate the students at the Learning Center are testing better than peer Copey students not attending the Learning Center. This is great news and all those at the Learning Center should be very proud of their work. As “Friends of Copey” this is again why we are involved. We have contributed to the increased enrollment and we stand behind the outstanding work Anna, John, Eve, and others are doing at the Learning Center. You are livin “the givin” back! I am currently on travel to Southwest Virginia and East Tennessee. This is the first of three trips made each year to attend meetings and visit my family and even a few childhood-friends. The serious business part of the trip pertains to my duties as member of the Board of Trustees for Emory and Henry College, located in a very small rural community about 30 miles from the East Tennessee border. I grew up nearby and graduated from this small college about 44 years ago. I am completing my second year of a four-year term as Trustee of the college and I am joined by 30 plus other volunteer Trustees who serve and share together our love for the college. Various walks of life and professions are represented and we extend back as many as 60 years since graduation with the oldest members on the Board. Without doubt, the driving force behind the serving as a Trustee is the strong desire to give back something out of gratitude for what we individually received as a student or through some other connection with the college. Jane, a very colorful, musically gifted, and multi-talented Trustee sent a note to me recently and used the phrase… livin “the givin” back. This phrase describes about all of the Trustees I have grown acquainted with in my short time. This is especially true of Jane. Upon reading the phrase, I immediately thought of Seidy Rodriguez, one of the co-founders of the Learning Center. After Siedy obtained her college degree, she returned home to Copey with the vision to do something to help her small community. She saw the need to start the Learning Center to help the young students with their education. She found a way to give back to her community and began the livin “the givin” back journey. The Learning Center is about 5 years old now and it has survived mostly on volunteer teachers from around the world along with community support to start and keep the Learning Center operating. I also think many of the “friends of Copey” are motivated by the desire to give back something. We recognize that our lives have been blessed in one or more ways. We know that someone or someplace made a difference somewhere along the way in our lives and without it, we would be less fortunate and far less successful. If we look closely, we see in our past a special teacher, or a school, a relative, or friend, perhaps an experience made a significant or life changing positive difference in our journey through life. There are many accounts when just a word or phrase, a small gesture or deed changed or redirected the course of life for many. Livin “the givin” back is a lot of what we do as “friends of Copey”. Are you one of those wondering why you are involved or connected as a follower of “friends of Copey”? This is a great question. Why be concerned about kids living in a small town in Costa Rica? For me, I was taken by Seidy’s desire to do something for kids. I was attracted by the idea that “with many working together, each doing just a little, much could be done”. This small town is very different from towns in America. It does not have a truck load of resources on hand to do much…no Rotary or Kiwanis Club, no Junior Achievement, no United Way, and certainly very little if any government support. Our support as “friends” is welcomed by the Learning Center because we work hard to help meet its needs but not interfere and impose ourselves on the Learning Center. We only want to provide assistance and support without strings attached. Please read or re-read the recent letter from the Learning Center’s Board Chairwoman. She expresses on behalf of her Board and the community their gratitude for the support we provide. What is expected of a “friend of Copey”? Really, not much. For those of us who pray…please continue to pray! For those of us who believe positive thinking generates positive results and outcomes…spend time each day thinking positive thoughts about our efforts. For those inclined to want to do more, keep informed and be on watch. At times, a special request may come along that will touch you and inspire you to go beyond praying and thinking. You may have an idea, a talent, a skill or knowledge that will help the cause. Finally, even a small donation may be part of your involvement although never required as a “friend”. In all instances, you will be livin “the givin” back. Please realize as a follower, each of you contributes something just by reading the Posts. The Blog records “visits” to the Post and lets me know people are following and keeping in touch. As a result, I report to the Learning Center that we are growing in numbers and interest remains strong in what is we are trying to do. If you do not visit the Blog, our numbers drop. This is why I continue to ask you to be a dedicated follower and to share this Blog with family members and friends because Blog numbers matter a great deal. Thank you very much for your interest and ongoing encouragement. Send a note or email anytime you want to share anything with me. I always look forward to connecting with you and enjoy you being on this journey.